Well, I finally had to upgrade our Christmas book basket! I loved the little red one (You can see it HERE! ), but it just wasn’t able to hold them all. And I’ve added quite a few new ones this year! 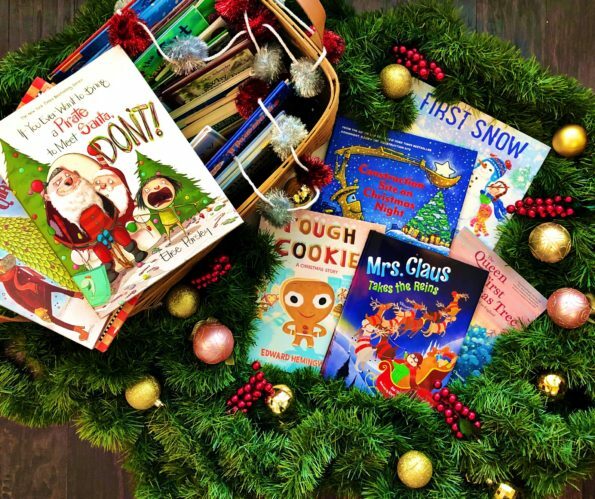 We still love all of our old books, but I don’t think I’m wrong in saying there’s something fun and special about receiving new holiday books every year. These are a few of our new-to-us favorites this year! This book is SO CUTE! Santa wakes up with a cold (a man cold, if you will) on Christmas Eve and declares that Christmas must be cancelled. Mrs. Claus comes to rescue and says she will take Santa’s place, and of course comes up with a fantastic plan to deliver all the gifts. She has to overcome a few problems, but she does just as good (Dare I say better??) a job as Santa. The illustrations are so much fun, and the story is really cute. And who doesn’t like a good story where the woman saves the day AND gets credit for it?? Our elf on the shelf brought this book this year, and my kids love it! It’s about an elf who is trying to escape capture, since everyone tries to catch him instead of Santa! It’s told in verse, and a really fun book to read, especially if your kids love their elf. This is still my 9-year-old’s favorite book, and I love it too. It’s about a giant named Humphrey and an elf named Leetree who live in Christmastown. They are tasked with growing that year’s Christmas tree, but must come up with a creative solution when their perfect tree disappears. It is BEAUTIFULLY illustrated, and it’s a sweet Christmas story. I highly recommend this one if you don’t have it already. If your kids like funny books, this is THE Christmas book for them! It’s a take on the Gingerbread Man story, except this cookie is so tough that the fox has no interest in eating it! They spend the book trying to figure out why Cookie is so tough and unsweet. There are recipes for sugar cookies and dough-ornaments at the end too! Another book in the Magnolia Says DON’T! series! We all love these books, and this is the newest one, perfect for a Christmas gift. In this one, Magnolia takes a gold-toothed pirate to meet Santa, and all kinds of mayhem ensues. It’s very funny and cute, and the illustrations, as usual, are wonderful! I pre-ordered this one, and I’m so glad we added it to our collection! Y’all. This book is SO beautiful. I would buy it for all young ages, but I think it works especially well for the 5 and under crowd. Fewer words and more illustrations about the first snow of the season leaves lots of room for little imaginations to make up their own stories about snow and the kids in this book. The drawings are absolutely gorgeous. I know a couple of people who I’m buying copies for for Christmas! I won’t lie. This is a children’s book, but as a royals fan, I love this book for myself! However, if you want to stick to gifting it to someone more age appropriate, I would say it’s perfect for kids who love to read the American Girl series. It’s about Princess Charlotte, who became queen when she married King George III of England, brought over her tradition from Germany of decorating a tree branch for Christmas. Over time, that turned into decorating an entire tree for the holidays, something England had never seen before. If you know a child (or an adult . . .) who loves historical fiction, the royals, or learning about women in history, make sure you get this book! It’s so good! My kids might be a little too old for this one, except I don’t think anyone is ever too old for wonderful picture books! We love Goodnight, Goodnight, Construction Site so much that I had to get this Christmas sequel. The trucks are all getting ready for Christmas, and there’s a special gift for each one. If your kids love the first book, you just have to get this one too! What a wonderful little series! Well, it’s officially Fall, even though it doesn’t really feel like it in Texas. 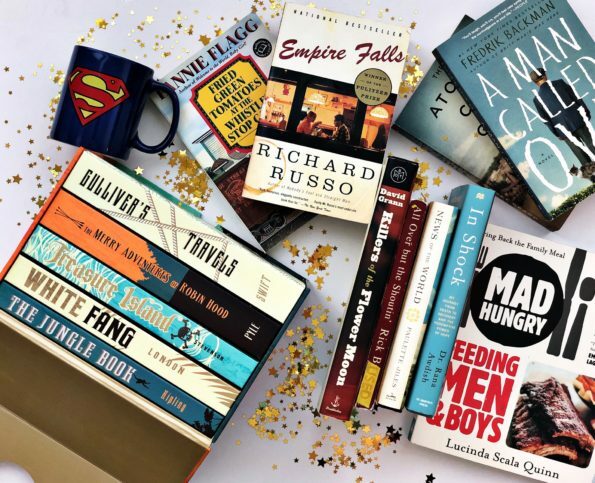 Even though we’re still having 90-degree days, I’m still in the mood to do some seasonal reading, and I feel like there are more to choose from this year than ever! I’ve been very drawn to re-reads and classic mysteries lately, and you’ll see those reflected in my lists below. 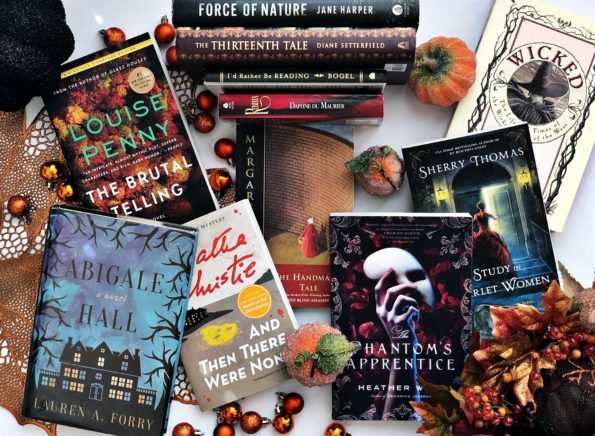 I’m including cozy mysteries, spooky stories, and comforting, curl up with a blanket Fall reads! Hopefully you can find a few to add to your own seasonal reading list. Let me know if there are some I need to add to mine! *Books marked with an asterisk were sent to me by the publisher! All opinions are my own! I have been in such a mood to re-read lately, something I don’t do nearly as often as I would like. New books and a staggering nightstand stack (not to mention several shelves of unread books and an overflowing book cart) are what generally keep me from picking up a book I’ve read before, but I’m determined to read these 3 by the end of November. They are 3 of my very favorite classic books, and they each have a dark, foreboding tone that is perfect for Fall! Rebecca is one of my favorite books, but I haven’t read it in years! Rebecca is swept off her feet by a handsome widow and taken away to Manderley, his mansion. When she gets there, she has to fight the presence of his dead wife, as well as the housekeeper, Mrs. Danvers. This could also fit into the Spooky category, as it’s a classic gothic novel. If you haven’t read it, this is the year to do it! For a really spooky night, watch the Alfred Hitchcock movie version, followed by the classic film Gaslight. I promise you won’t be disappointed! I’m going to say something controversial and dividing. I haven’t watched The Handmaid’s Tale on Hulu yet. I KNOW. But I want to. I don’t love everything Margaret Atwood has written, but I do love this book. It’s dystopian literature about what would happen if men were in charge and women were used as wives and procreators only, and it is so, so good. If you haven’t read Atwood before, or didn’t love some of her newer novels, try this one. I think anyone can enjoy it, and it will give you a lot to think about, especially in regard to who should have control over an individual’s body. Can we agree that Lois Lowry is one of the original queens of YA? I grew up reading her books, and The Giver has long been a favorite. Yes, this is a middle grade/YA novel, but I think it can be enjoyed by any age. If you have older kids, this would also be a great fall buddy read with them. This is another dystopian novel about a boy who lives in a seemingly perfect world. When he is given a job as the Receiver (of memories), he learns that the world he lives in might not be so perfect after all. This is still one of the best dystopian novels I’ve ever read, and is still highly relevant today. A trend I’ve noticed quite a bit lately are bookish re-makes of classic stories. When done well, I love classic stories that are re-written in either a modern way or twisted around to make a completely new story. These are a few that are on my TBR list, and one (Wicked) that I want to re-read before I see the musical for the umpteenth time! A Study in Scarlet is considered the first Sherlock and Holmes novel, and Sherry Thomas has taken that series and twisted it around with a woman (Charlotte Holmes) as the main character. I AM HERE FOR THIS. Charlotte has never agreed with the London society norms of women remaining quiet and unobtrusive. When a string of unsolved murders hits the city, she sets out to find the killer, under the assumed name Sherlock Holmes, and prove that she doesn’t have to sit back and watch life pass her by. There are three books in this series so far, so if you’re looking for a good re-visited classic, this is the one to start with! The Phantom of the Opera is one of my favorite novels, and if you’re looking for a real creepy book, read that one. The Phantom’s Apprentice takes that story, of Christine the opera star, her lover Raoul, and the Phantom/Angel of Music and gives it even more depth, delving further in the minds and psyches of the main characters. I am SO excited to read this because while I love the original book (and musical, of course), it would be nice to get to know the characters better and understand why they make the choices they do. Plus, Katie at basicbsguide recommended it to me (and sent me my copy), so I know it’ll be fantastic! You’ve probably all at least heard of Wicked the musical, but I’m not sure how many people have actually read the book it’s based on. In case you’re not familiar, it’s the story of the Wicked Witch of the West/The Wizard of Oz as imagined by Gregory Maguire. And she’s not exactly the villain everyone knows her as! If you’ve never read any of Maguire’s books (they’re all twisted fairy tales) this is a good one to start with. Some of them can be a little strange, but Wicked is great. I love when villains get their own story! This is also my in real life book club’s pick this month, and I can’t wait to discuss it with them. This is a new YA novel, but it seems perfect for adults who like twisted classics. This is a re-telling of Frankenstein from the perspective of Elizabeth Lavenza, a ward of the Frankensteins. She is tasked with taking care of Victor Frankenstein. When he leaves for his studies, Elizabeth worries that she no longer has a future without him to take care. She goes on a search for him, and what she discovers is thrilling and horrifying. Reader confession: I have never read Frankenstein, but now I want to just so that I can read this and fully enjoy it! (Although I have seen Young Frankenstein. Does that count?) This book sounds amazing, and a wonderful twist on the traditional story. I probably don’t need to offer a lot of explanation for this one, except that I REALLY want to read it. It’s a re-telling of Shakespeare’s Macbeth, in modern times (the 1970s), set against a police crime backdrop. Macbeth is an Inspector, Hecate is a drug lord, and Lady is, yes, Macbeth’s one true love. Jo Nesbo is a genius when it comes to writing thrillers, and this seems like a perfect fit. Truly, Shakespeare’s plays are set up so wonderfully for re-tellings, and the dark background of this novel is especially fitting for Fall. It’s finally October, my favorite time of year, and while I don’t generally read horror books (with the exception of Final Girls by Riley Sager), I do enjoy a good, spooky book when the weather starts cooling down and it gets darker earlier. These are a few that fit that category, and are more spooky than creepy. Force of Nature is a gently spooky novel by the author of The Dry, and I loved this one even more! A group of women head into a forest for a company retreat, and one of them doesn’t come back. You can check out my review of Force of Nature HERE! I absolutely love the idea of reading this book in the Fall. Any story involving a forest is usually spooky, there’s a mystery to solve, but it’s not going to scare you so much that you need to leave ALL the lights on. A gothic tale about a reclusive author, her stories, and secrets for all the characters involved? Yes, please! I am here for a slightly spooky book that makes me want to keep reading one more chapter to see if I can find out something else about the characters. Madeleine at Top Shelf Text recommended this book, and I blindly trust her opinion on books like this! I plan to read this before the end of October for sure! Setterfield has a new book coming out in December called Once Upon a River , and I wish it was being released sooner. It also sounds SO perfect for a cold, Fall night. This is another YA book that I think will be perfect for adults looking for a spooky story they can read quickly. This is a book of 15 short stories about witchy women in the past, present, and future, so you can pick it up and get your spooky Fall reading in in short doses along with whatever other book (Books?) you’re reading. I picked this up at Barnes & Noble and almost sat down to read the entire thing right there. If you want a truly creepy book that’s reminiscent of Rebecca (this would make a great companion read), Abigale Hall is a great choice. I read this last year and couldn’t put it down once I started. (You can read my review of it HERE!) It’s about two sisters, Eliza and Rebecca, who have lost their parents in WWII and are sent to live in a crumbling old mansion in Wales. The owner is never seen and Mrs. Pollard, the housekeeper, is more than a little odd. When Eliza discovers a book covered in blood, she decides to find out what’s going on in the house, and why none of the other girls who have worked there have survived. Y’all, if you only pick one spooky book to read this Fall, please make it this one! It is so good, and fantastic gothic fiction for people who don’t want the complete gore of a horror book. Let’s be honest. It’s still 90 degrees in Texas some days. I don’t care. It’s officially Fall, I have my glittery pumpkins out, and all I want to do is curl up with a soft blanket and pretend it’s 60 degrees outside. These are a few books I’m planning to do that with in the next couple of months! If you haven’t heard of Anne Bogel yet (her blog is Modern Mrs. Darcy and her amazing podcast is I’d Rather Be Reading), then please let this book introduce you to her. She is a wonderful writer and book-recommender, and this book is full of short essays about the reading life. They’re quick to read and perfect for curling up under a comfy blanket and reading about the life of a fellow reader. Guys. Have you been to Three Pines? If you haven’t, please, please, please make this the year you start the Inspector Gamache series. Louise Penny has created a mysterious, well-developed world in Three Pines, Canada, and each book gets better and better. You do need to read them in order, starting with Still Life (my review of that is HERE), but this is the book that I’m on. I am so happy to be back in Penny’s world of mystery, murder, and Gamache’s cleverness. If you’re wishing you could be traveling this Fall instead of . . . not, this is a wonderful book to get away in. Anthony Doerr wrote the Pulitzer Prize-winning All the Light We Cannot See, and this short book is the story of how he wrote it. When Doerr won the Rome Prize (basically a paid-for year in Rome to live and write), he moved his wife and newborn twins to Rome to write All the Light We Cannot See. This book tells the story of that year and what life was like in Rome. With twins. Doerr is a talented writer, but I really love behind the scenes stories, and this is a great one! I haven’t read Tana French before, but I’m going to start with this book. She does have a series, but The Witch Elm is a standalone, and it sounds PERFECT for Fall. Toby, recovering at his family home after a run-in with burglars, finds a skull in an elm tree trunk in the backyard. To find out who the skull belongs to may require Toby to acknowledge that his family’s past may not be what he thought it was. It sounds so, so good, and I know French is a skilled writer. (She is an Anne Bogel recommendation, and I trust her!) I’ll definitely be fitting this in soon. And finally, I can’t have a Fall book list without Anne of Green Gables on it. I love this series so much, and it’s perfectly cozy for Fall. Yes, they are considered children’s books, but every time I read them I get even more out of them. If you haven’t read Anne, or haven’t read her in a long time, I highly recommend doing so this year! I’m going to be re-reading Anne of Avonlea soon if anyone would like to read along with me! Well, Father’s Day is upon us, and as usual, I have ordered a few gifts for my dad at the last minute!! I always include at least one book for him at every gift-giving opportunity, and since we like to read a lot of the same things, it’s always fun to try and find something he doesn’t have yet. (Which can be very, very difficult!) 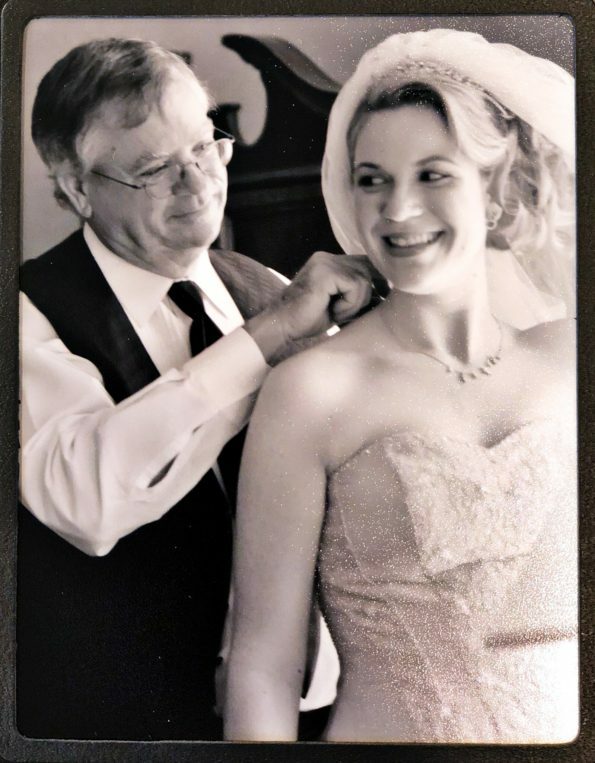 I’m featuring a few of my favorites that I’ve given to my dad, some that I’ve loved that I think others would love, and some that I think new dads (or all dads) need! Let me know in the comments any book suggestions you have for Father’s Day! With the exception of Dispatches from Pluto, which I already owned, I bought the rest of the books listed here for my dad and I to both read! There are so many amazing travel books out right now. Books to Buddy Read with Dad! 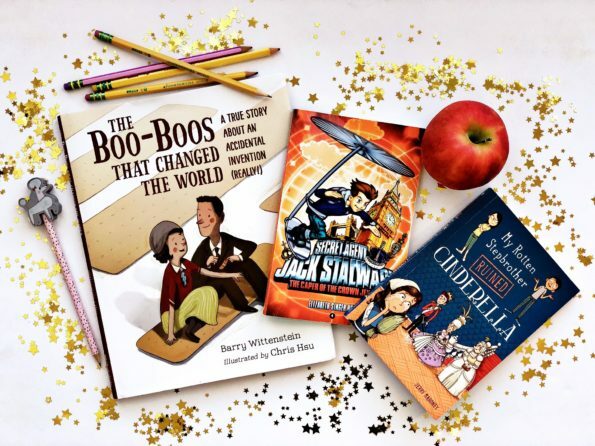 My dad has very strong memories of what his favorite books were as a child, and I know some of my favorite moments as a parent have been when my kids love a book that I read as a child. So I think a really fun idea would be to give your dad a copy of his favorite childhood book, or a classic childhood adventure book, and buddy read it together! It would be so meaningful, and fun-I don’t think bookish people get tired of those favorite childhood classics! Summer Reading 2018: Taking Back My TBR! It’s that time again! Summer, when we all make plans to read ALL THE BOOKS. I’m doing the same thing, but I’m also doing something a little differently (for me) this year. As much as I love receiving advanced copies of books from publishers (and one of the books is one of those) and digital review copies of books, I can also get very bogged down with all of the things that I “have” to read. So this summer I’m coming up with a list of books I want to read. And that’s the only requirement. Yes, I will still be reading and reviewing my publisher copies, but I want to make a lot more time for books I want to read, whether they’re backlist, new, and in between. 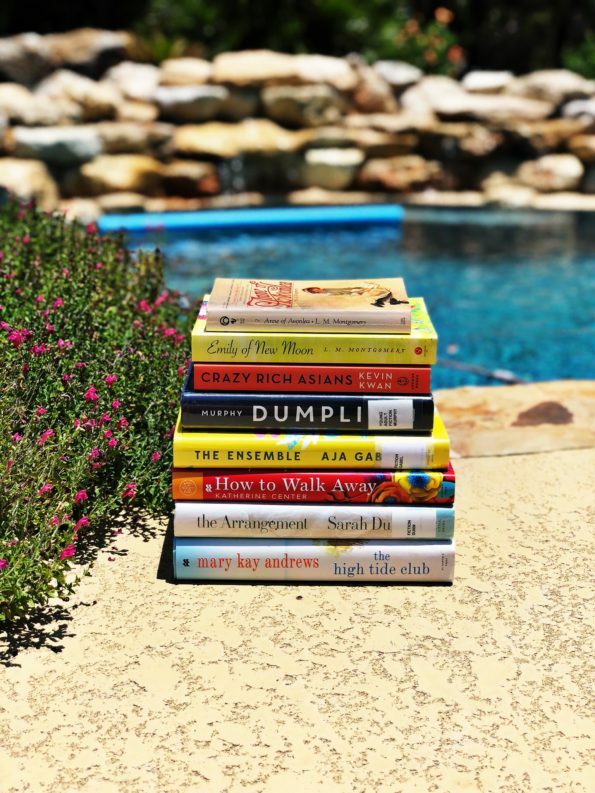 Today I’m sharing 15 books I’ve been wanting to read, and I will be putting them first as much as possible this summer! The rest of the books I read will be a combination of planned books and last-minute picks! Tell me what books you’re excited to read this summer, and if you’ve read any on my list tell me what you thought! This is our June Bucket List Book Club pick, along with the sequel, Us Against You (out June 5), and it’s because I’ve been wanting to read it for what feels like forever! Fredrik Backman is one of my very favorite authors, and I’ve heard nothing but wonderful things about Beartown. Beartown is a small community where everyone knows everyone. The town has come together over the possibility of the local hockey league winning a national semi-final game. That game ends with a violent act that begins the action of the rest of the novel. Beartown is about small communities and how close, and far apart, the people who live there can become. And because it’s Backman, I know the writing is going to be stellar. This is the second book in L.M. Montgomery’s Anne of Green Gables series, and I’ve been wanting to re-read it all year! In this sequel, Anne becomes a schoolteacher, has more adventures at Green Gables, and continues her friendship with Gilbert Blythe. I love this series so much, and if anyone else is looking for a warm, funny, surprisingly poignant series, I would love for you to read along with me! I know some people consider themselves Anne girls, and some people consider themselves Emily girls. I’ve never read Emily of New Moon, also my L.M. Montgomery, and it’s been sitting on my shelf for almost a year. Emily is different from Anne, but I really trust Montgomery, so I’m excited to read about her adventures. Like Anne, Emily is an orphan, and she goes to live with relatives at New Moon Farm. While her relatives aren’t exactly kind and welcoming, she makes friends and might start to finally feel at home. Another book I’ve wanted to read for quite awhile! Now that it’s being made into a movie (out August 15), I definitely want to read it this summer so that I can see it. (Book before movie, people, book before movie.) Rachel Chu and her boyfriend Nick Young live in New York. When Rachel agrees to spend the summer in Singapore with Nick and his family, she’s not expecting for his home to basically be a palace and to realize that his family is rich and famous. Rachel has to navigate her new view of Nick, in addition to his relatives and other people who might not have her best interests at heart. This is the first in a trilogy, and seems like a fantastic option if you like family sagas, which I do! The Ensemble was released on May 15, and when I heard Annie B. Jones talk about it on her podcast (From the Front Porch), I immediately added it to my must read list. It’s not something I would usually go for (except for that gorgeous cover), but she made it sound so good that I already have it in from my library holds! It’s the story of four friends who all play classical music together in their group, the Van Ness Quartet. Seems benign, but as a group they go through failures and successes, ups and downs, and all the hard things that friendships can go through. It is getting wonderful reviews, and I love finding books by debut authors! Lilac Girls has been on my TBR forever, and when Katie (at Katie Lady Reads) sent it to me and said it was her favorite book of the year so far, I knew I needed to finally get it read! It takes place during WWII when the Nazis invade Poland and then turn to France. This particular WWII story is told through the eyes of three women: New Yorker Caroline, Polish Kasia, and German Herta. I really love how war stories about women are becoming more prevalent-they played a huge role and often went unnoticed and unthanked. I am so ready to lose myself in this story and find out what happens to these three women. This book was my Book of the Month selection for May-when I saw that Taylor Jenkins Reid recommended it (another one of my favorite authors), I added it to my box immediately. It’s part romance, part drama, and deals with how a person might react when put into an impossible situation, and I am always here for that. 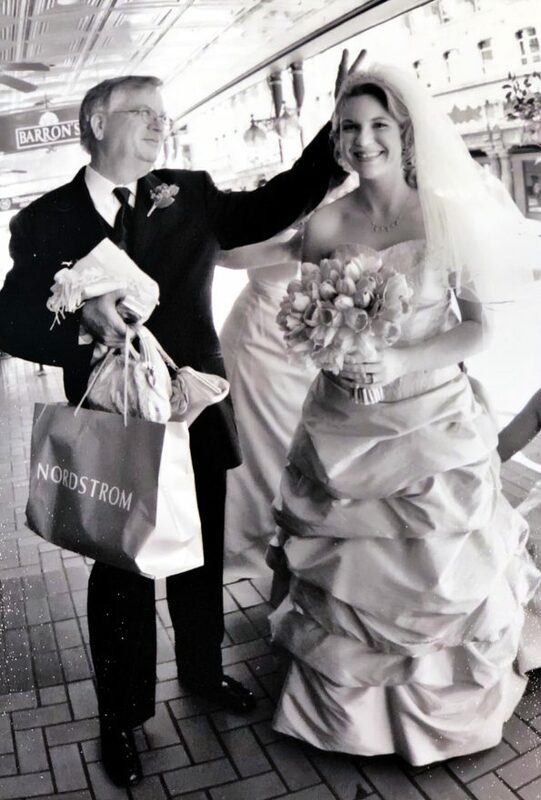 Margaret Jacobsen has a new fiance, a great job, and a perfect life. When an accident lands her in the hospital at the beginning of the novel, she has to deal with her whole world falling apart, and figure out if what has been important to her still is, and if she still has the ability to let people in. Thank you to St. Martin’s Press for the free copy of this book! I have read every one of Mary Kay Andrews’ books, and this one looks just as good as the rest, maybe even better. Her books feel like summer to me, so this one is on my must-read summer list as well. Like so many of the books I love, this is about a group of women who were best friends and kept all each other’s secrets. Fast forward decades later, and only one is still alive. Josephine hires an attorney, Brooke Trappnell, to find the descendants of her friends so that she can make amends . . . and maybe solve a murder. This is a novella in the Court of Thorns and Roses series, and while I’m a little wary (I loved the first two books in the original trilogy and felt let down by the third), I still can’t wait to go back to the Night Court and see what Feyre and Rhysand are up to. They are rebuilding from the devastating events of the last novel, and are about to celebrate the Winter Solstice. But of course, the dark clouds never really go away, and Feyre will have to navigate those while learning how to be the High Lady of the Night Court. I believe this novella is meant to be a bridge between the original trilogy and the next, so I’m interested to see how Sarah Maas connects them. Let’s be honest. Regardless of your political affiliation (or lack of affiliation, as a lot of find ourselves these days), the political world can be fascinating. Cutthroat, fast-paced, and never the same from one day to the next. But what about the spouses? I love stories about the other side of big things, and Campaign Widows is just that: the story of a group of women in Washington, D.C., who become “widows” when their husbands go on the campaign trail. This seems gossipy, juice, and based in just enough fact to make me wonder how much of it is actually true. Are you a Cassandra Clare fan? If you’re not, what are you even doing with your life?? Just kidding! Kind of. If you like fantasy, please, please go read her books. All of them. Her Shadowhunters series (The Mortal Instruments, The Infernal Devices, and The Dark Artifices) are some of my favorites, and unlike other authors, her books truly get better with each new one. Ghosts of the Shadow Market are a series of short stories about the characters from those series and are meant to give more insight to them and what they’ve been up to. (And I think they’re meant to tide us over until her next book comes out!) These look quick and short, and I can’t wait to read them all. So this is not a book I would normally pick up. It’s about a married couple who, having fallen into all the trappings of a traditional, suburban life, decide to make theirs an open marriage for six months as an experiment. At first glance, this is not my type of book. But when Knox McCoy greenlit it as a favorite book on The Popcast, I changed my mind. On the surface, yes, this is a book about an open marriage. But what it really seems to be about is marriage, relationships, and how the people in that relationship change when pressure is applied. And as I’m sure you can tell from a lot of this list, I do love books about what happens to regular people when put into extraordinary circumstances. This is such a fitting book to end my summer TBR list with. Y’all, I am ready for school the be out and to not have to sign up for 10,000 things on 5,000 SignUpGeniuses. (But I love SignUpGenius. Don’t mistake end of year burnout for hatred of the SignUpGenius.) This book is what it looks like: a book about the different types of moms, how they try to contribute to their children’s classrooms, and how hilarious it can be when trying to get all of these moms to work together and agree. Now that it’s summer, I’m definitely ready to laugh about it. It seems like a lighter, bookish version of the movie Bad Moms, and I can’t wait!